The long-anticipated mobile-friendly update by Google, Mobilegeddon has finally gone live. The main idea is to make mobile-friendliness as a ranking signal, thereby posing a challenge to businesses that do not have mobile-friendly sites. The update aims at bettering search experience for users on their mobile phones by providing relevant and quick results. This is applicable for information searched on mobile-friendly pages or on a mobile app. Google has been considerate with webmasters by giving continuous warnings on the importance of Mobilegeddon over a period of months, before actually launching the update. October – The mobile usability component was added to webmaster tools highlighting mobile usability issues Google finds on websites. November – The line of text was introduced by the search engine along with its own mobile friendly testing tool to know if sites are mobile-friendly. January – Google used webmaster tools to find out which sites are not mobile friendly and started sending warnings to them giving a hint of the update. February – The sites that did not pay heed to the warning in January, were alerted again in February with the announcement of the launch of Mobilegeddon on April 21st. It will purely affect search rankings only on mobile devices. Search results in all languages across the globe will see a change. It’s on a page by page level that assesses individual pages and not the complete website. The search engine confirmed that it will affect only the ten blue links. Google News, the Google Local pack, Google Image search and other Google search properties would see no change. Anticipations pointed out Mobilegeddon to be bigger than Panda and Penguin in terms of the impact it would have on search results. Any update launched by the search engine takes some amount of time to roll out. It is not easy to accurately calculate its impact in just a week. The effect will be majorly felt only in the weeks to come. Having said all this, the update does not seem to have the impact it was hyped to. There were some shifts noticed in mobile results the very next day of launching the update, but they were not major. 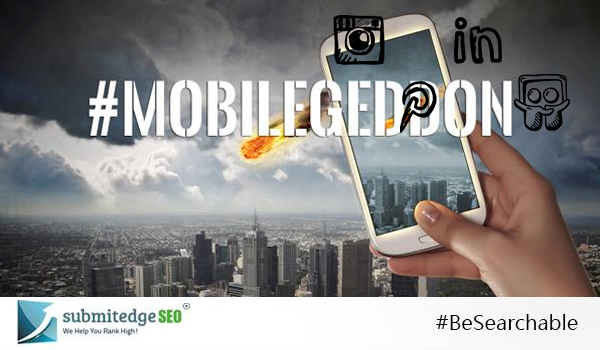 SEO metric companies tracking Mobilegeddon have not been able to see significant effects of it, yet. Polls have been conducted where webmasters have agreed about not facing a major change till now. Even though it did not show much change the next day, a good shift has been felt after a week. A few reports highlight a significant shift in mobile SEO visibility. If you have been affected by the update for not having a mobile-friendly site, check the mobile performance now and make the necessary alterations. You can conduct a Google’s mobile-friendly test on your website to find out the errors and fix them. A mobile-friendly label next to the site signifies that you are safe. All these are conclusions drawn of what is being noticed in one week after Mobilegeddon is launched. It can take two weeks or even more to roll out completely. Keeping the current scenario in consideration, all that can be done is to wait and see the changes in mobile search rankings in order to understand the full impact of the update.